The Signature Project a massive new form of art that incorporates the entire electromagnetic spectrum—from X-rays to the visual spectrum and to radio waves. 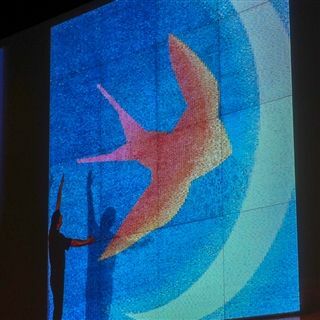 When finished, the painting will include over 1 million signatures! As part of the school’s Formal Dinner Guest Speakers, Patrick spoke on one of our core values – Purpose. This unique and total engaging performance, Patrick communicated the emotional and visual essence of his work. He wove his creative genius into the show with interactive video, images, and even played guitar in the tradition of Irish story telling. EHS students even signed a section of the painting!